One of the things I love about Go is the profiling and debug information you can generate. There is a special environmental variable named GODEBUG that will emit debugging information about the runtime as your program executes. You can request summary and detailed information for both the garbage collector and the scheduler. What’s great is you don’t need to build your program with any special switches for it to work. 18 // Wait to see the global run queue deplete. The code in listing 1 is designed to be predictable against the debug information we expect to see emitted by the runtime. On line 12, a for loop is declared to create ten goroutines. Then the main function waits on line 16 for all the goroutines to finish their work. The work function on line 22 sleeps for one second and then increments a local variable ten billion times. Once the incrementing is done, the function calls Done on the wait group and returns. It is a good idea to build your program with go build first, before setting the options for GODEBUG. This variable is picked up by the runtime, so running Go commands will produce tracing output as well. If you use GODEBUG in conjunction with go run for example, then you will see trace information for the build prior to your program running. 1009ms : Time in milliseconds since the program started. This is the trace for the 1 second mark. gomaxprocs=1 : Number of processors configured. Only one processor is configured for this program. 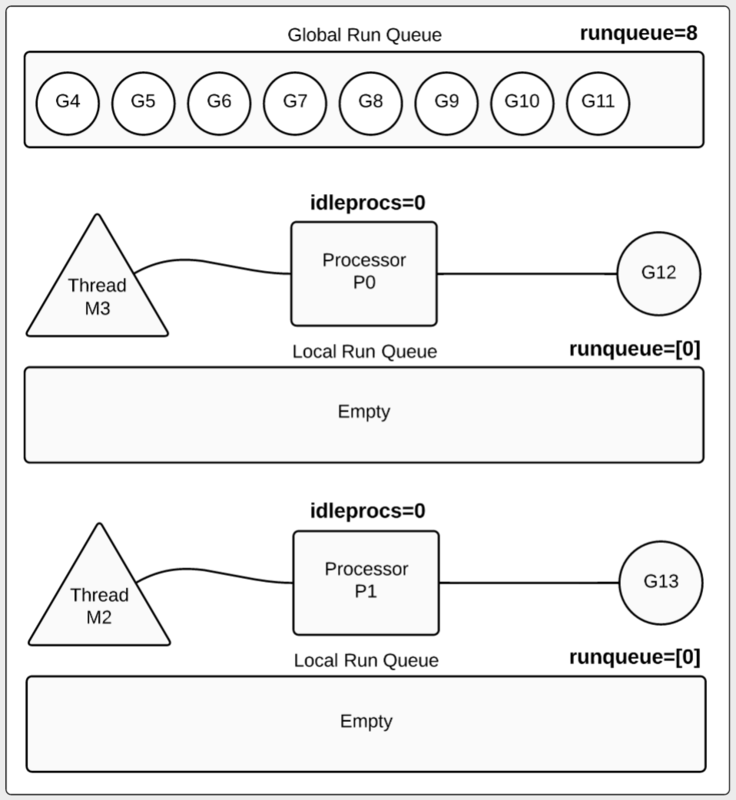 threads=3 : Number of threads that the runtime is managing. idlethreads=1 : Number of threads that are not busy. 1 thread idle (2 threads running). 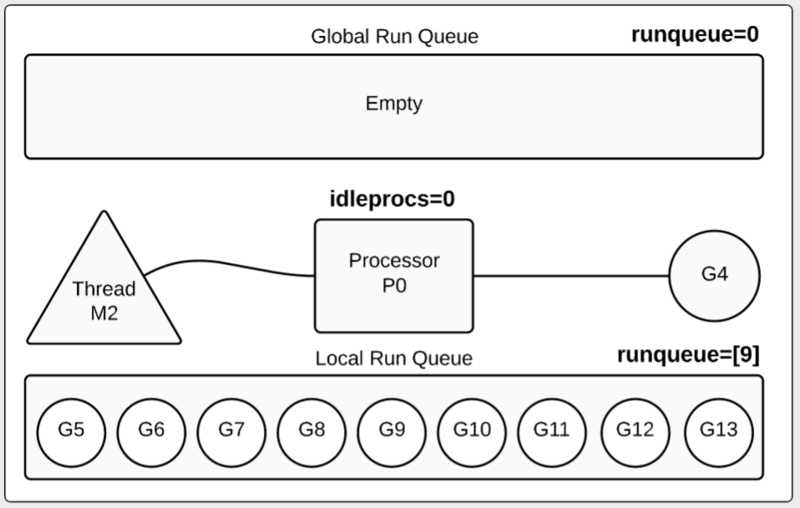 idleprocs=0 : Number of processors that are not busy. 0 processors are idle (1 processor is busy). runqueue=0 : Number of goroutines in the global run queue. All runnable goroutines have been moved to a local run queue. : Number of goroutines in the local run queue. 9 goroutines are waiting inside the local run queue. The runtime is giving us a lot of great information at the summary level. When we look at the information for the trace at the 1 second mark, we can see how one goroutine is running and the other nine goroutines are waiting inside the local run queue. 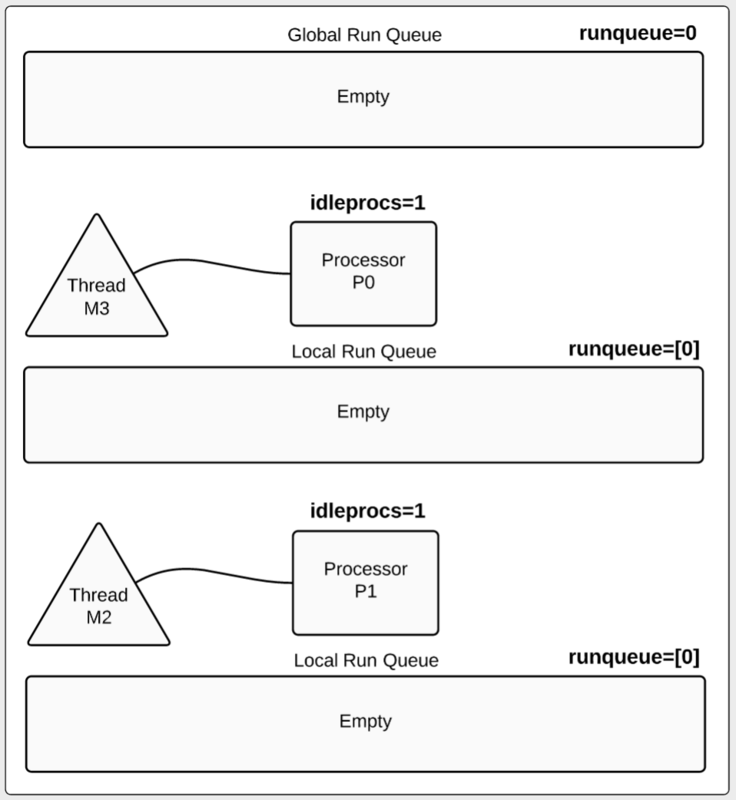 In diagram 1, the processor is represented by the letter P, threads by the letter M and goroutines by the letter G. We can see how the global run queue is empty based on the runqueue value being 0. The processor is executing a goroutine based on the idleprocs value being 0 and the remaining goroutines we created are in the local run queue based on the value of 9 being inside the brackets. 2002ms : This is the trace for the 2 second mark. gomaxprocs=2 : 2 processors are configured for this program. threads=4 : 4 threads exist. 2 for processors and 2 for the runtime. 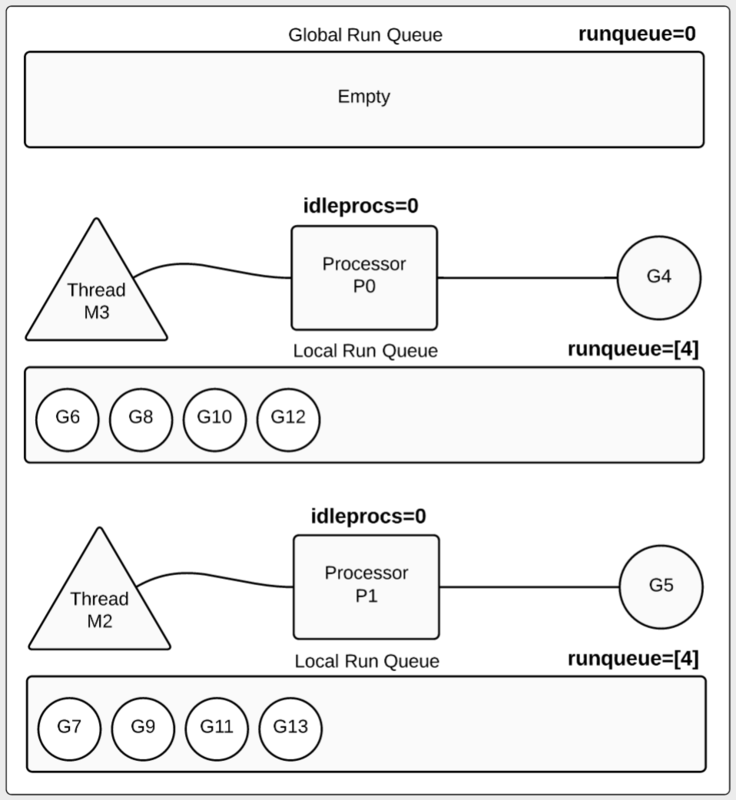 idlethreads=1 : 1 idle thread (3 threads running). idleprocs=0 : 0 processors are idle (2 processors busy). runqueue=0 : All runnable goroutines have been moved to a local run queue. [4 4] : 4 goroutines are waiting inside each local run queue. Let’s look at the information in diagram 2 for the trace at the 2 second mark. We can see how a goroutine is running in each processor. We can also see that eight goroutines are waiting inside of the local run queues, four goroutines inside each of the two local run queues. runqueue=2 : 2 goroutines returned and are waiting to be terminated. [3 3] : 3 goroutines are waiting inside each local run queue. When we get to the 6 second mark things change. Now in diagram 3, two of the goroutines we created completed their work and have been moved to the global run queue. We still have two goroutines running, one in each of the existing processors and three are waiting in each of the respective local run queues. In many cases, goroutines are not moved back to the global run queue prior to being terminated. This program has created a special situation because the for loop is performing logic that runs for more than 10ms and is not calling into any functions. 10ms is the scheduling quant in the scheduler. After 10ms of execution, the scheduler tries to preempt goroutines. These goroutines can’t be preempted because they do not call into any functions. In this case, once the goroutines reach the wg.Done call, the goroutines are instantly preempted and moved to the global run queue for termination. runqueue=8 : 8 goroutines returned and are waiting to be terminated. [0 0] : No goroutines are waiting inside any local run queue. 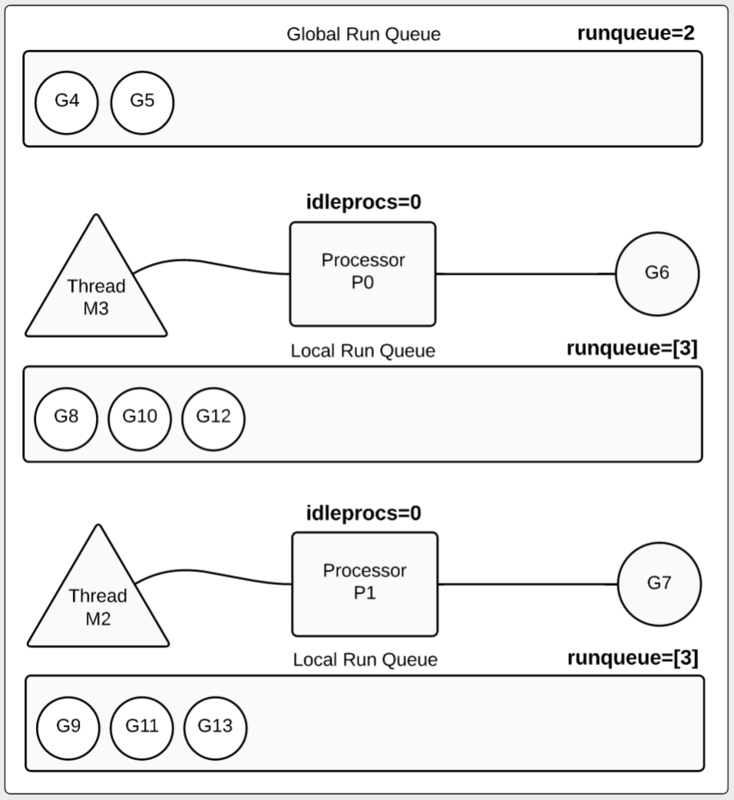 In diagram 4, we see how eight goroutines are in the global run queue and the remaining last two goroutines are running. This leaves each of the respective local run queues empty. idleprocs=2 : 2 processors are idle (0 processors busy). runqueue=0 : All the goroutines that were in the queue have been terminated. At this point, all the goroutines have finished their work and have been terminated. Here we see how thread M3 is attached to processor P0. This information is in both the P and M trace records. If this program continued to create goroutines, we would see this number increase linearly. If this program was handling web requests for example, we could use this number to get a general idea of the number of requests that have been handled. This estimate would only be close if the program didn’t create any other goroutines during the handling of the request. We can see that the goroutine for the main function is in a status of 4, blocked on a semacquire which represents the wait group Wait call. With a basic understanding of the scheduler and knowing the behavior of our program, we can get a detailed view of how things are being scheduled and the state of each processor, thread and goroutine in our program. The GODEBUG variable is a great way to peek into the mind of the scheduler while your program runs. It can tell you a lot about how your program is behaving. If you want to learn more, start by writing some simple programs that you can use to predict the traces coming from the scheduler. 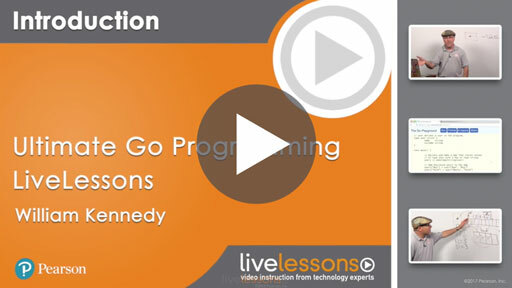 Learn what to expect before trying to look at a trace for more complicated programs.